For a couple of years at least, those words were heard on a regular basis at Valley Parade. They usually coincided with a defeat, or in response to dropping to a less-than-inspiring positioning in the league table. It was a philosophical stance to take. An acceptance and understanding of the bigger picture. Exactly 10 years ago last week, Bradford City exited administration after spending nearly all of 2004 in this financial state of limbo. It was the second spell of administration in a couple of years, and on more than one occasion the situation looked terminal for the Bantams. During one particular July 2004 morning, fans gathered outside Valley Parade fearing that the 101-year-old club was about to be wound up. City survived this closest of calls, and a route was mapped out for exiting administration by the end of the year. They’ve sailed close to the wind on a couple of occasions since, but thankfully there has been no third administration. Not that a decade-long spell largely in the black has proven a case of onwards and upwards. The situation got worse before it got better. And even now, the legacy of Geoffrey Richmond’s £36 million debt continues to impact on the club. In 2004/05, we accepted everything with good grace. We enjoyed the highs that little bit more, knowing how close we had come to an alternative existence of empty Saturday afternoons. Like someone who has endured a health scare but, from surviving it, suddenly develops a new-found respect for life, the air tasted good. And moments such as victories over Sheffield Wednesday and Huddersfield were all the more special. “At least we still have a football club to support.” But in time, expectations inevitably rise. Soon, a sense of disappointment returned regarding the club’s continued struggles on the field. And – understandably – the mantra of being grateful merely to have a club was criticised by those leading the disgruntlement. How long can we simply be grateful to at least “still have a football club to support”? At what point does this turn into an excuse for accepting mediocrity? To have a football club to support is to have ambition to achieve things and to be entertained. It can’t just about settling for seeing out your days losing at home to Hartlepool and Port Vale. A year after exiting administration, then-manager Colin Todd was already under pressure over his team’s failure to mount a credible promotion push. Another year of standing still later, and Todd’s car was vandalised after another abject home defeat. He wouldn’t last another five weeks. A change was demanded and made, but it doesn’t lead to improvement. Instead, there is relegation from League One in 2007. The issues were not blameable on one man after all. There is more misery to come, as City spend the next six years struggling in the basement division – often looking more likely to fall into non-league than return back up the pyramid. Club legend Stuart McCall is exactly the right man to galvanise the club and he gives the place a major lift, but the third coming doesn’t work out. Mark Lawn’s investment makes City more competitive, but they still punch below their weight. Peter Taylor is best forgotten. Peter Jackson looks beaten all too quickly. “At least we still have a football club to support” – but is it worth all of this? Did we all raise all that money to save the club in 2004, just so we could endure the pain of relegation battles, wretched home defeats and Darren Holloway? Do we enjoy still having a club to support, when ‘support’ means booing the players routinely? Saturdays might have felt empty without Bradford City in our lives, but on many occasions they would have proven much less painful too. Then the decline bottoms out and the bounce back is spectacular. 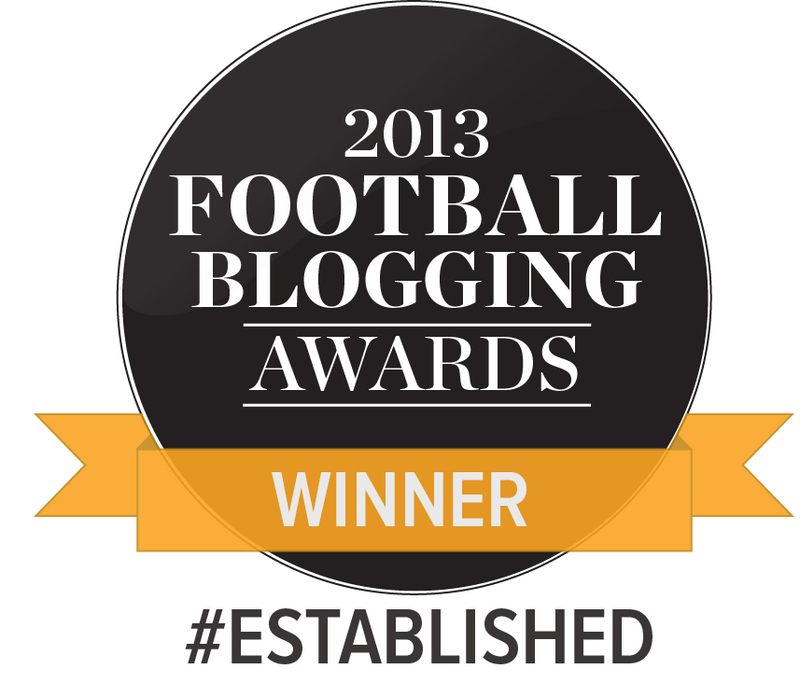 2012/13 – what more can you say? The best campaign ever, in many people’s eyes. Certainly the best season this side of the millennium. A wide range of dizzying highs are experienced. The memories will be treasured forever. It is the biggest of paybacks for keeping the faith. This is why we saved our club. This is why we continued to follow them in the darker hours. 10 years on from exiting administration, so much about Bradford City is transformed and yet many of the fundamentals remain unchanged. In December 2004, the Bantams sat seventh in League One, in a season where better-run clubs would eventually fill the top six places. In 2004, City struggled to win matches at home; leaned heavily on the loan market; had to pay rent to play inside their own stadium; appeared short of the financial strength to get back into the Championship. The current situation is almost identical. If in December 2004, it felt like the club had fallen to its lowest ebb, there’s something depressing about the fact that much of the subsequent decade has been spent struggling simply to get back to that 2004 level. The major difference in 2014 is that Bradford City are almost entirely debt-free. They have become a more profitable business. Yet still, it feels as though we are close to hitting our head on a glass ceiling. That promotion looks a tall order within these constraints. The potential is there, and that will soon lead to a creeping up of expectations within supporters. But the vision and the financial clout is lacking. At times, this is hard to accept. But no matter what has happened over the past 10 years, and whatever lies in store, there is one statement that remains relevant. One that from time-to-time still needs to be dug out, to remind ourselves of how bad it really could have been. Good piece Jason, we need to keep a perspective about where we’ve come from before we start demanding instant success. The board have diligently rebuilt the club and confidence in it and also importantly within the community again. That doesn’t mean we can’t be ambitious but lets trust the board to see what they have and where it can take us. As the saying goes, ‘Lets not try to run before we can walk’. Plenty of reasons to move into 2015 with optimism. A sustainable debt free business run by two fans for whom the club not their own aggrandisement is paramount. A club able to set a competitive budget whilst giving the working man an affordable ticket price and one that maintains its soul as a community club not the vanity project of the rich/crooked. Plenty of scope to increase the fan base to achieve Championship football. On the playing side a management team upon which other clubs will be casting envious glances and a crop of talented new players. Youth development which has consistently produced in recent years. As to lack of financial clout it is only a problem if your aim is to buy success a la Bournemouth rather than earn it. As a fan who grew up in the 70s watching basement footy (our natural level post 1945) todays heady heights do not seem that disappointing! Whisky. I will have a pint of what you are drinking because you, like Jason are spot on. I think if we are honest that most fans appreciate where we are, where we are going, and how we are doing it, mainly because most of us have experienced the lows, the admins, and the very thought of losing the club. There are always going to be critics and often its a small minority who tend to be the most vocal, via the message boards etc. All the points made, substainability, affordable tickets, etc are valid and you cannot put a value on them. Would we have taken our current position ten years ago? If we did get back into the Championship (Which is where I personally would like to be) then would we supporters want to push on and reach the Premiership again? I think there would be a sizeable number of us quite happy to stay at that level, but it would be a very natural desire, (and we must bear in mind we have a lot of supporters who because of age did not experience the Premier League days), to reach those heights again. An interesting dilemma, but one I guess we would like to face. Cheers Mark. As to the Premiership Burnley have shown us the way. Still owned by Local Businessmen as far as I can see and managed on and off the field sensibly. For all GRs faults he managed it on some moderate investment (albeit from elsewhere!) and his vision. He must bitterly regret his decisions thereafter! ps I just hope we can hang onto PP. Spot on – as much as I hate to admit it Burnley are the prototype that we need to follow. Live within our means but we should aspire for the Premier League one day otherwise what’s the point in supporting a club otherwise. If we get to Premier League and come straight back down because we don’t have the financial clout to compete I’d be happy but the days out would be worth it and hopefully one or two scalps along our way. I remember carrying a Bradford City Coffin outside of the Town Hall, when the council sat back and were unwilling to lend any type of hand. I really think that one of the reasons the club lasted was because of the T&A throwing all their wait behind the “Save our City” Campaign to raise £250k…. things like that make all the difference! City are making steady progress under parkinson and he is moulding another team of history makers that fight to end, play for each other and above all else are entertaining the fans whilst getting results. Just 1 point off the play offs and plenty of winnable games over the Christmas period. We are in the best posisitions in years to springboard into the next level. The team really has played well over the last 6 games since McLean left and stead was brought in. Yeats & Meredith, Stead & Clarke & Morias & Darby are linking and combining superbly recently and with a bit more of a killer instinct in front of goal and continued improvement in understanding & free flowing football a top six place may not be too far from our grasp. A platform had been built to push on & improve from last season. Keep up the good work city. Here’s hoping for an extension in contract for Morias & the full time signing of Jon Stead. I was glad to see that parkinson wasn’t considered for the Reading job as I believe we are developing well under him and he seems willing to recognise his own mistakes including McClean. I agree with Andy and Luke that we have a good platform to build on. Good to see that Luke learned from the Literacy lessons he had in my class at primary school, good journalistic writing on show!! Another thought provoking article on WOAP. I am proud to say that I got involved with the Bradford City Supporters’ Trust during the dark days of 2004. I remember spending time with the likes of Margaret Hainsworth and Mike Mason making homemade banners and putting them up on roads including the top of the M606 and the A650 to tell people about an emergency meeting at Valley Parade in the summer of 2004. David Markham refers to these banners in his book The Pain and The Glory. I also organised and participated in a sponsored ground hop to raise funds and met a young man called Stephen Onions. Since then we have become great friends and out of the adversity of 2004 we have witnessed together many superb Bradford City games including that famous night at Villa Park in January 2013. Many other people invested their valuable time and money to save Bradford City Football Club. It was a huge team effort and I am sure that all of us who helped to save our football club appreciate it just a little bit more when we see our team playing either home or away. Personally, I am not bothered about gaining promotion to Division 1, the Premiership for you marketing people. Unfortunately in my humble opinion money has ruined football and I am much happier in the lower leagues where we can still have some connection to our club. I am aware that some people will disagree with me on this point and they are entitled to their opinion but I am happy simply watching my team playing at Valley Parade and away from home at grounds where you can still stand. 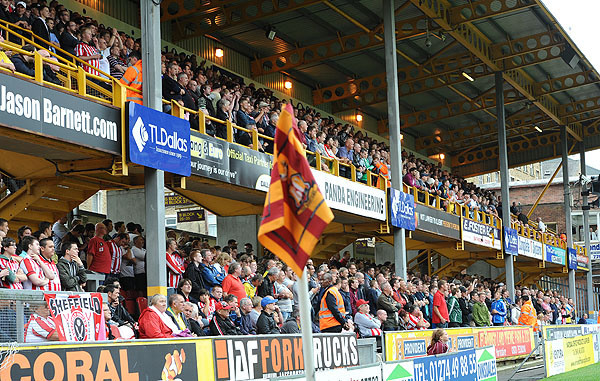 Jason, Like many other fans, I have been on the Bradford City rollercoaster for more time than I care to remember. I agree with your assertion that Championship football should be within our grasp and for a city of 500,000 souls, Championship football should be sustainable. Bradford is the largest city in the UK without a football team in the top two divisions. I wouldn’t want a return to the Richmond era and his philosophy of ‘if it’s round and moves, kick it, otherwise borrow or lease it’ combined with an unsustainable push for the Premiership because the stakes are simply too high. But unfortunately, the financial model in our division is currently dependent upon having a benefactor to underwrite their club’s losses (two-third of Div 1 clubs use that model and 90% in the Championship!) and that without one, life is much more difficult. Couple that with very low season ticket prices for supporters and owners who are unwilling or unable to either dig into their own pockets or sanction a rise in its debt to the same level as we’ve had for the previous 6 years or to consider the sale of shares to the wider supporter base then I don’t know how a promotion push next season or the one after is to be funded. A few posters have suggested following the Burnley model as a possible way forward. I’d welcome that but the ‘facts’ around the Burnley model need to be further analysed. They didn’t do it on a pittance. Their approach was three-fold. Firstly, their two owners injected several millions each of their own money into the club (as equity, not loans) for a promotion push and to re-purchase Turf Moor. Secondly they encouraged a small group of Burnley supporters to also inject smaller six figure amounts to reinforce the owners’ investment. Thirdly, they adopted a sustainable ticket pricing policy which placed them in the middle of the pack expecting supporters to rightly also put more money into the club. As we know, this paid off for them and no doubt the investers are being recompensed. So yes, the Burnley experience could be emulated. But it won’t happen without more money going into the club’s coffers either from the current owners or new investers or from us, the supporters. If the club is genuinely serious about taking the next step then I hope we can take some lessons from Burnley’s experience. Valuable insight. I don’t think promotion is necessarily out of the question on the funding model as it stands at the moment but it will involve PP extracting pretty much the maximum potential from the resources he has available .He has the talent to do this..